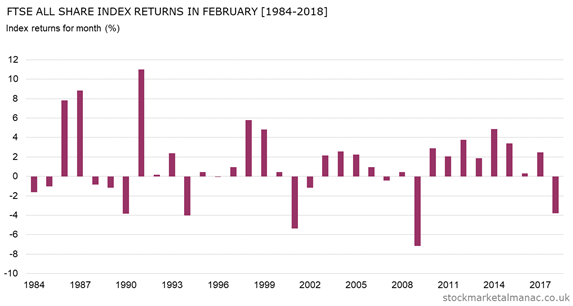 Since 1970 the average month return of the FTSE All-Share Index in February has been 1.5%, with the month seeing positive returns in 63% of years. A glance at the accompanying chart will show quite how strong the market has been in February in recent years. Since 2009 the market had been up every February…until last year, when the index fell 3.8% in the month. From the chart it appears that February has the strange pattern of a run of years where it has positive returns punctuated every eight or so years with a significant fall in the month. However, notwithstanding that, since 1994 market has only seen significant negative returns in four years. There’s no obvious reason why the market has been so strong in this month; although one possible explication might be that, also in recent years, shares have been weak in January and so they experience a bounce-back rally in February. In an average February shares tend to rise strongly on the first trading day, then trade flat for a couple of weeks, before gaining strongly in the middle of the month and finally drifting off slightly to month end. A feature of February is that, with January, it is the best month for mid-cap stocks relative to the large caps. Since 2000 on average the FTSE 250 Index has out-performed the FTSE 100 Index by 1.6 percentage points in this month, and in that time the large cap index has underperformed mid-caps in February in only four years. On the international front, February is one of the four months in the year that the FTSE 100 Index has historically out-performed the S&P 500 Index. Since 1999 the UK index has underperformed the US index in February in only four years. Although the out-performance is somewhat attenuated once currency is taken into account as GBPUSD is historically weak in February. In the last ten years FTSE 350 sectors that tended to be strong in February are: Industrial Engineering, Mining, and Household Goods; weak sectors have been: Mobile Telecommunications, Pharmaceuticals & Biotechnology, and Banks. It’s a busy month for analysts as there are more FTSE 100 results announced during the month than any other ­ 36 companies announce their prelims in February (as do 55 FTSE 250 companies). Aside from shares, historically this has been a strong month for gold and silver. Further articles on the market in February. This entry was posted in February, Market, News and tagged month review by Almanacist. Bookmark the permalink.